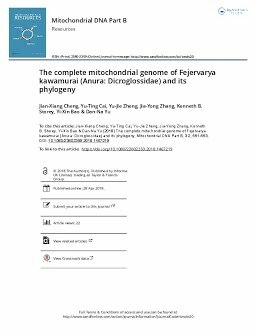 The mitochondrial genome of Fejervarya kawamurai is a circular molecule of 17,650 bp in length, containing 13 protein-coding genes, two rRNA genes, 23 tRNA genes (including an extra tRNA-Met), and the control region. The AT content of the whole genome is 56.9%. In Bayesian inference (BI) and Maximum likelihood (ML) analyses, we found that F. kawamurai is a sister clade to F. multistriata and F. limnocharis. The monophyly of Fejervarya, Quasipaa, Nanorana was well supported (1.00 in BI and 100% in ML).